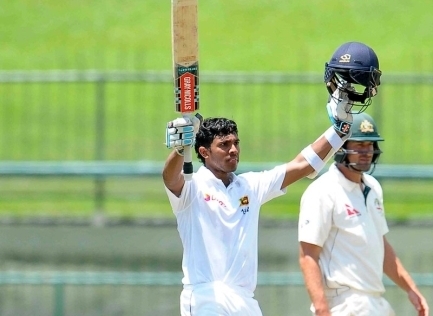 Kusal Mendis had one first-class century before Thursday, the third day of Sri Lanka's first Test against Australia. He walked to the crease at 6 for 2, after a wicket had fallen from the third ball of the morning. Sri Lanka were 80 short of making Australia bat again. Mendis had survived only seven deliveries in the first innings. The ingredients were all wrong, but like the world's greatest chef, he somehow fashioned them into a masterpiece. Australia could only watch on as Sri Lanka's fans were served up a rare treat. The most remarkable thing was that by tea, Sri Lanka were on top in the match. Their first-innings debacle of 117 had made their job difficult, but Australia's task in the fourth innings would be no easier. Mendis, with help from Dinesh Chandimal, had given Sri Lanka's bowlers something to defend. At the break. they were 167 runs in front. Five wickets were still in hand, and things were getting out of hand for Australia. Mendis was on 157, alongside Dhananjaya de Silva, who had reached 24, and the Sri Lanka total was 253 for 5. During the first session, they lost three wickets for 110 runs, but in the second session, Australia's efforts bore just a single piece of fruit - the dismissal of Chandimal for 42. But Mendis was very much the key wicket required by Australia in a Test in which no other batsman had so much as scored a fifty. He was sublime all around the wicket. He played straight, but always looked to score, pulling and flicking classily through leg, sweeping effectively, cutting when the fast bowlers gave him width. Mendis struck 19 fours and brought up his century in his 143rd delivery with his only six, slog-swept over deep midwicket off the bowling of Steve O'Keefe. He soon moved on to his highest first-class score. Mendis had made precious few mistakes throughout his innings, although on 142, he drove a tough caught-and-bowled opportunity through the hands of Josh Hazlewood. Australia were also left to regret not asking for a review when Mendis was on 66, after he had missed an attempted sweep off Nathan Lyon, who was coming from around the wicket. The Australians seemed barely interested in sending that one upstairs. Instead, they frittered away both of their reviews on deliveries from O'Keefe that were, respectively, pitching outside leg and only just clipping leg stump. The Australians were not alone. Not since United Passions hit the cinemas have worse reviews flowed from every direction. Dimuth Karunaratne and Kaushal Silva both needlessly contested their lbws early in the morning. Starc's pace beat Karunaratne in the first over of the day and O'Keefe sneaked his arm ball through the defences of Silva. Neither man reached double figures, and nor did captain Angelo Mathews, who was caught at bat-pad for 9, off the bowling of Lyon. Australia had picked up three wickets before lunch, but Mendis was already past fifty and proving to be a headache. Things got trickier for Australia in the second session as Mendis and Chandimal compiled their 117-run fifth-wicket partnership, easily the highest of the match. O'Keefe left the field with an injury to his right hamstring, and any half-chances presented to Australia seemed to go begging. On 24, Chandimal popped up a very catchable return chance that was spilled by Starc. Finally, the breakthrough came, as Chandimal was trapped lbw by Mitchell Marsh, who managed to nip the ball back in late. Still, it was the only wicket of the session as Mendis found a new ally. The debutant de Silva, who got off the mark with a six in the first innings, boldly thumped a boundary over mid-on to get off the mark this time, and by tea, the new partnership had grown to 50. But this was all about Mendis. The rest were simply his support staff. Just before tea, he brought up his 150 with a cut to the boundary off Lyon, off his 211th delivery. He walked off to a standing ovation from the small crowd. It is hard to believe if anybody present - even Mendis himself - could have expected such a scenario when play began this morning.